In the last few years I have seen, and participated in, some excellent online courses that are run by some of the world’s top universities. My introduction to free online education was when FutureLearn sent me an email to introduce some of their first courses. Today I heard about Coursera, another provider of Massive Open Online Courses (MOOC), in a BBC article. 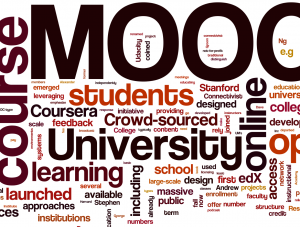 MOOCs are becoming the hot new thing. They are, as the name suggests, open to everybody, free to access and use and all materials and teaching is provided online. Anant Agarwal, a computer architecture researcher at MIT, started his discussion about Moocs with: “I would like the re-imagine education”. Until now, education had hardly changed in the last 500 years. He believes that the Moocs we see today are only just the beginning of a radical change in global education (although in fairness, every TED talk predicts a radical new future). My experience so far has only been with FutureLearn, which is owned by the Open University (I studied Health Sciences with the OU a few years ago, which is why I got an email about Futurelearn). I actually received an email just when I was researching courses to help improve my writing (did it work???) and enrolled on Start Writing Fiction, which is run by the Open University (in fact, maybe the OU emailed me, not FutureLearn). This was an excellent introduction to creating characters and developing plots. The eight week course provided a series of articles, video lectures and interviews with authors. Each “lesson” included a discussion and feedback on writing was provided by other students. Following Writing Fiction I went on to study Obesity, a four week course run by Reading University (I used it as a refresher for the Challenging Obesity module of my Health Science qualification). I then signed up to Introduction to Journalism, which was run by the University of Strathclyde (ongoing, in the final week now) and Digital Marketing, which was a three week course run by the University of Southampton. Each of these courses provided an excellent introduction to the topics in a way that is far superior to reading random articles online or attempting to read a text book on these topics. The universities each had their own style, but generally followed the same format on FutureLearn, which meant that by time I started my second course I was very comfortable with the format and could just focus on the course material. Each course generally only requires a few hours per week, although in reality I took longer than this (maybe I still waste time staring out of the window…). FutureLearn’s Simon Nelson addressed delegates at the EMOOCs 2014 Conference – watch the video here. In it he quotes Thomas Friedman, who said of Moocs that, “Nothing has more potential to lift more people out of poverty – by providing them an affordable education to get a job or improve in the job they have. Nothing has more potential to unlock a million more brains to solve the world’s biggest problems”. The most striking feature of these courses was their global reach. The Writing Fiction course and Intro to Journalism had thousands of students (the first day of Journalism was very busy with a few sluggish page loads on their website) but they never felt too busy. The Intro to Journalism Twitter page (each course usually has its own Twitter, Facebook and Google Plus groups to provide more ways for students and teachers to communicate) said that it had 10,000 students on the first day. There were students from all walks of life, from A level students who were thinking about study journalism at degree level to professional journalists who were looking to improve their skills. Many students were working for international newspapers and could provide a different perspective on journalism than could be given by a Glasgow university alone (not to take anything from the excellent work done by the Uni of Strathclyde). Coursera was mentioned on the BBC today because Google has reported that more people are now searching for information on Coursera than on Cambridge University. According to the Coursera website there are currently 10,150,512 Courserians (the figure rises by one approximately every second) and there are 859 courses that are run by 115 partners. Courses range from topics such as New Models of Business in Society (University of Virginia) to The Music of the Beatles (University of Rochester). You can learn just about anything really – languages, sciences, law, art, health, engineers, education and computing. It works in pretty much the same way as FutureLearn – you create an account, sign up to a course and start studying. Course materials are viewed online or downloaded and discussion takes place mostly with other students. These courses are all short courses and provide no recognized qualifications, but they do provide an excellent introduction to a huge range of topics. Some courses offer certificates of participation, which although not an official qualification, they do provide evidence of continuous educational development which can be useful for job seekers and those seeking promotions at work. They are mostly used purely to gain an insight into a new topic. For me, they have provided an with a way to improve my writing skills and marketing knowledge without requiring me to enrol in a college. I can fit the study in around work and family. One added feature of FutureLearn is that the courses remain open after you start, so if you fall behind you can catch up in your own time. Although the discussions may die down, you can complete the course material. Also, the popular courses are repeated (Start Writing Fiction started again just over a week ago) so if you do fail to complete a course you can have another go one the next run. This new age of MOOCs is being driven by a faster and more connected Internet. This is yet another example of how the Internet is providing huge benefits to people all over the world. Although it could be argued that the universities are using MOOCs to help market their paid courses, we should not ignore the fact that many are doing far more then recycling old lecture notes and distributing if for free. Almost any topic can now be studied through a MOOC and although professionally recognized qualifications are still only available via premium online course websites such as CoursesPlus and LearnDirect, there is a definite shift in how people are starting to pursue educational hobbies. When I was working for the Forestry Commission I remember that our secretary was studying Philosophy with the OU; this was my first introduction to the Open Universality (beyond watching bearded gentlemen lecturing maths on the BBC) and I was amazed how dedicated a middle-aged woman could be to work full time, raise a family and study such a complex subject just for fun – some people are born to keep on learning. However, back then the only option was to pay the OU thousands of pounds for the privilege of an education, something that few people can afford. A quick search reveals that there are many free online courses available. Open Culture lists 1000 free online courses that are run by universities – many are single lessons though. MIT has its own Open Courseware website that provides free learning in topics ranging from architecture to Quantum Physics. The BBC Learning pages (now called iWonder) provide courses in English, history, health, gardening, media studies and sports. They also work in partnership with OpenLearn, another open university initiative that provides free courses. MOOCs free courses from the world’s top universities are providing opportunities to people all over the world. As more people embrace the Internet we are likely to see a rapid growth in online learning. FutureLearn is only one year old we can expect to see more Mooc providers appear that will fill the gaps in education and training. Maybe one day schools in deprived areas will be able to gain access to top quality education over the Internet by using websites, video and VOIP, Skype and Hangouts. You never know, we may soon start to see professionally recognized qualifications available for free with MOOCs. Free education empowers everybody and has the potential to change the world for the better. If there is one thing that the Internet has consistently demonstrated it is that people want to share and learn. This suddenly reminded me of a story a year or so a story about elderly ladies and gentlemen helping overseas students with their English by using Skype – I just Googled and found a story in the Daily Mail – I don’t think that was the one I originally read. The Speaking Exchange project unites Brazilian students with native English speakers from America; usually retired individuals who are happy to help students who are eager to learn English.